Cocaine, the drug fueling the trade that’s left thousands dead in Mexico and Central America since 2007 and which 1.4 million Americans are addicted to, originates with two species of the coca plant grown in the South American Andes. Ninety percent of the U.S. market for cocaine is fed by Colombia, with the rest largely provided by Peru and Bolivia. An estimated 310 to 350 tons of refined cocaine were trafficked out of Colombia last year, enough to make a rail of nose candy that would encircle the earth twice. Along with exporting cocaine northward, Colombia has become a laboratory for failed drug war policies that are finding their way to Central America and Mexico. In July 2000 President Bill Clinton signed Plan Colombia (see sidebar below for more information) into law, initiating the anti-drug-producing and trafficking operation that has cost U.S. taxpayers more than $7.3 billion to date. U.S. military bases have been established in Colombia under the plan, as have extensive air patrols, pesticide spraying and surveillance. Because of the violence, some 2.5 million Colombians have been displaced. “The lessons of Colombia are being ignored in many ways. You’ll have mainstream analysts saying Colombia is the model to win the drug war. If Colombia is winning then what are the Colombians trafficking?” drug war expert Sanho Tree, a fellow of the Institute for Policy Studies in Washington, D.C., told The Indypendent. “Basically, our policy is to fracture and to break up the drug organizations, making them smaller, weaker and more manageable,” Tree said. “And it’s folly. Breaking up those big monopolies … created a huge vacuum for smaller operators to fill, and we can’t track smaller operations, much less disrupt them.” Prior to the escalation of the U.S.-backed drug war, large traffickers, such as the Medellín Cartel led by Pablo Escobar in the 1980s, ran much of the drug trade. Now, smaller outfits have filled that void. Just as busting up the big “drug monopolies in Colombia ended up democratizing the drug economy,” Tree explained, “if you end up weakening and fracturing the big fish in Mexico, then you end up with a Darwinian solution so that only best survive. This ill-conceived state power ends up thinning out the herd, with the most cunning come out on top — selectively breeding supertraffickers.” The result is that billions of dollars and countless bullets are being thrown at smaller drug operations without generating long-term solutions. The “paramilitarization” of the conflict in Mexico and Central America is also replicating Colombia’s experience. Paramilitaries have been used to carry out a dirty war on behalf of the Colombian state, and the “paras,” as they are known, now run much of the drug trafficking there. Tree said, “People in Mexico are saying we need paramilitaries to chase down drug trade leaders and this runs the risk of repeating the same nightmare as in Colombia.” The right-wing paramilitary groups in Colombia, including the United Self-Defense Forces of Colombia (AUC), which claimed more than 15,000 combatants a decade ago, works closely with the Colombian military and wealthy landowners by attacking guerrilla forces and dissidents. At least 1,000 soldiers and police charged with human rights abuses joined the AUC over the years, supplying the outfit with intelligence and guns. An official demobilization of paramilitaries began in 2003, but the paras and successor groups continue to operate. They are protected from extradition to the United States despite their involvement in the drug trade, and stand accused of thousands of extrajudicial assassinations. In addition to the drug trade, paras orchestrate violent land seizures against small farmers and have moved into cultivating African palm trees for biofuel production on the stolen land, colluding with high-ranking military officers and in a few instances receiving funding from the U.S. government, according to The Nation magazine. “At the beginning of Plan Colombia, campesinos would plant out in the open, but those were sitting ducks, and it was easy pickings for the fumigation planes. Now it’s shade grown and intercropped with other crops, and the plants are also adapting in other ways that result in better yield per kilo of leaf,” Tree explained. The United States is focusing less on fumigations these days, in part because it’s harder to locate these smaller hidden plots of coca. While a handful of indigenous tribes legally produce a tiny amount of coca for government-sanctioned cultural purposes, most of the coca grown in Colombia is used to produce cocaine. For peasants in Colombia, farming coca is generally more lucrative than growing fruits or vegetables. Part of this is due to the fact that coca and coca paste are easier to transport than other agricultural products, especially for isolated farmers far from roads. Tree explained that many coca farmers have a small “lab” behind their house to transform the coca into coca paste. The lab consists of a wooden floor with a black plastic tarp over it, a 50-gallon drum of gasoline and ammonia. The coca is often chopped up by a weed-wacker, and processed with the chemicals into paste, which is later turned into cocaine to be sold in the U.S. markets. In a country of 46 million, Tree speculates, hundreds of thousands of people earn a living from coca farming and coca paste production. The people who grow coca are “the expendable ones,” he said, “they are fixed targets” for eradication and anti-drug efforts, whereas the traffickers are more mobile. “If you’re a coca farmer you can be wiped out, and the traffickers can buy from another peasant.” The farmers play a crucial, but risky role in the business, receiving a fraction of the money the trafficker receives. Smuggling the drugs carries its own obvious risks, but traffickers tend to get compensated in proportion to the dangers they face, since once cocaine gets across the U.S. border, its price increases dramatically. The drug war both in the Andes and in Mexico and Central America has resulted in bloodshed, displacement of poor communities and expansion of U.S. regional power. Since 2006, Mexico’s drug war has left more than 46,000 dead and displaced some 230,000. Drug interdiction efforts in Mexico and Colombia have transformed Central America into a key hub linking South America to Mexico and the United States. According to the L.A. Times, in 2010 more than two-thirds of U.S.-bound cocaine shipments passed through Central America, almost tripling in four years. Traffickers are also shifting production facilities. In March of this year, a major cocaine processing lab was discovered in Honduras, whose government fell to a U.S.-backed military coup in 2009. Central America has become one of the deadliest parts of the world, with approximately 79,000 homicides connected to drug trafficking and organized crime since 2005. Cocaine is derived from the coca leaf, but there is a big difference between the natural plant and the refined drug, which is one of the main arguments of coca farmers against the eradication of their crop. 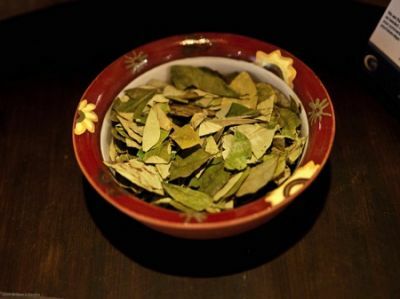 Coca leaves have been used in the Andes for millennia to relieve hunger, fatigue and sickness, to increase oxygen flow to the brain at high altitudes, and as a religious and cultural symbol. The green leaf also sustains Bolivians on a variety of levels, from miners risking their lives in deadly tin mines to farmers in the altiplano, a high altitude plains region. Coca aids protesters in long, arduous marches, street mobilizations and hunger strikes. Bolivia’s most powerful social movements and political parties have emerged from the farmers’ fight to grow coca and resist militarization. eradication. Under Morales, a different kind of control of coca production has taken place. The Morales administration is continuing and expanding cooperative eradication efforts initiated in the central region of Chapare in October 2004. In established coca growing zones in Bolivia, families are allowed to grow 1,600 square meters of coca. Cooperative eradication between security forces and farmers has created a much more peaceful environment than times when violent eradication was the norm. The 1,600-square-meter limit is based on what the government calculates to be sufficient for subsistence, for traditional use and in meeting the national legal demand for the leaf. Despite Bolivia’s efforts, cocaine production has increased according to Kathryn Ledebur, the director of the Andean Information Network, a drug policy think tank based in Cochabamba, Bolivia. Ledebur explained that coca growers in Bolivia have adopted techniques that originated in Colombia that are “less expensive, harder to detect and a lot more efficient.” The new method involves using pulverized coca leaves with a high level of cocaine alkaloid, resulting in a more lucrative operation that requires less space. Nonetheless, Washington’s war on drugs stretches from Ciudad Juarez in Mexico to La Paz, creating a pretext for intervention in other nations. It also provides an excuse for the suppression of indigenous and radical movements, as was the case in Bolivia. Benjamin Dangl is the author of Dancing with Dynamite: Social Movements and States in Latin America, and The Price of Fire: Resource Wars and Social Movements in Bolivia. Plan Colombia is at heart a joint campaign between the Pentagon and Colombia’s military. Up to 1,400 U.S. military personnel and mercenaries at a time have worked hand-in-hand with Colombia’s armed forces on surveillance, spying, interdicting drug trafficking, fumigating and eradicating coca cultivation and raiding makeshift workshops that produce the cocaine. In 2009, two RAND Corporation analysts concluded, “strategic cooperation and large amounts of U.S. aid failed to stem the production of narcotics. Nearly two-thirds of global cocaine continues to be produced in Colombia.” They note the real success of Plan Colombia has been against the Revolutionary Armed Forces of Colombia (FARC), a guerrilla army that controlled large swaths of Colombian territory in the 1990s, shutting down much of the country’s oil production. Clinton administration officials blurred the line between the drug war and counterinsurgency. Gen. Barry McCaffrey, who oversaw U.S. forces in Latin America prior to heading the White House Office of National Drug Control Policy in the late 1990s, labeled the FARC “narco-guerillas.” Yet human rights groups and journalists have documented for years the Colombian military’s alliance with paramilitary death squads that were manufacturing and transporting cocaine and heroin or were in the pay of drug cartels. U.S. officials dismiss this as isolated incidents from a distant past, but in 2010, John Quirama, a Colombian soldier in a counterinsurgency unit, provided testimony on how the military works with drug cartels by protecting smuggling routes and carrying out raids and murders at the behest of drug barons. Quirama also accused a Colombian army colonel of running his own cocaine production facility. U.S. military aid has been used to beef up Colombia’s ground forces by 60 percent and create elite counterinsurgency battalions to battle the FARC and protect oil facilities. Washington has also supplied Colombia with advanced communications equipment, naval warships and hundreds of aircraft and helicopters, which are managed by the Narcotics Affairs Section of the U.S. Embassy in Bogota. The main result has been a weakening of the FARC, which is estimated to have 9,000 fighters, half the number it had a decade ago. Paramilitaries continue to kill peasant, indigenous and union leaders, but Colombia’s oil is flowing again, with production reaching 884,000 barrels a day in March, as guerrilla attacks on pipelines have declined from 270 in 2001 to a couple dozen a year. For its part, the United States has cemented its hold on Colombia, gaining access to seven new bases in 2009 that will allow it to conduct “full-spectrum operations throughout South America,” as explained in a U.S. Air Force document.